A huge thank you to Greg Beron of United Home Audio aka UHA for so generously providing one of the sampler tapes that Paul Stubblebine put together for him! Included on the tape are tracks from their Linda Ronstadt, The Band, Kenny Burrell/John Coltrane, Clifford Brown and Little Hatch tapes. Think everyone is going to enjoy this collection!!! Especially those that own one of Greg’s UHA decks! Great to see more tapes! Please add me to the list too, thanks! Please add me to the list. Thanks Myles. 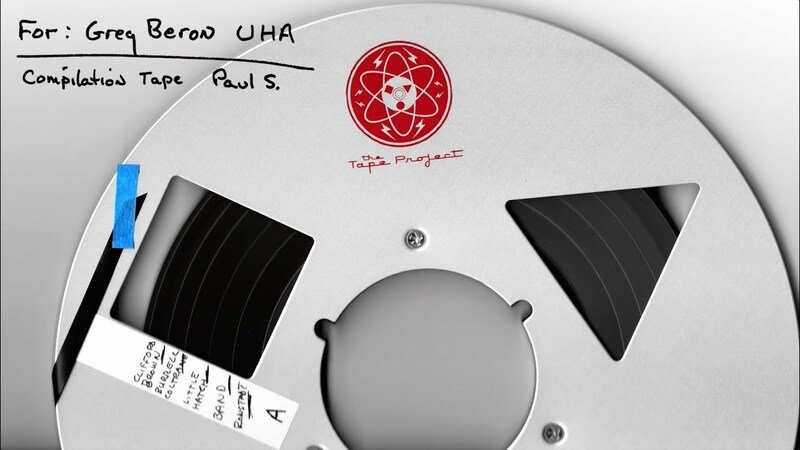 I've just received the UHA/The Tape Project tape this past weekend and I have already played it a couple of times. It is wonderful. It is not a full length 10.5" reel containing only 5 tracks but who's complaining! I will admit the first two songs on the tape were not my cup of tea for one reason or another, but the last three are really something with my favorite being the last track, a stunning Clifford Jordan track which is absolutely lethal. As a matter of fact, that's the track I will be featuring in an upcoming video I've shot for my YouTube channel which will also help promote this wonderful Tape Circle initiative Myles has come up with and which I am honored to be a part of (I have already uploaded the first video featuring the first tape I received: Opus 3 Records, Vol. 6. Feel free to go to that tape's thread to be able to click on the link if you would like to check it out). I should have the UHA/The Tape Project video produced and uploaded in the next couple of days. Once it has gone "live" I will share the link here. Incidentally, I expect to ship the tape(s) to the next participant by Wednesday or Thursday of this week. Last edited by vinylrules; 09-08-2018, 12:14 AM. As a matter of fact, that's the track I will be featuring in an upcoming video I've shot for my YouTube channel which will also help promote this wonderful Tape Circle initiative Myles has come up with and which I am honored to be a part of (I have already uploaded the first video featuring the first tape I received: Opus 3 Records, Vol. 6. Feel free to go to that tape's thread to be able to click on the link if you would like to check it out. I'm a charter subscriber to TP, so I have all the albums. The Linda Ronstadt is the only one of the series where Paul had to use a backup tape. He had problems with the original master. However, he did a great job with the backup. I had never heard or heard of the Band before, and enjoyed the album very much. I figured they were an instrumental group, then confused them with the Paul McCartney album (group?) Band on the Run. I ended up buying the DVD of the Last Waltz concert after hearing the TP album. My favorite TP album for sonics is the Little Hatch. This is one of Chad's recordings that he did, I believe, bringing Little Hatch to Salina. Others can talk about the artistic merits of the Kenny Burrell/John Coltrane and Clifford Brown albums. Both have excellent sonics. Glad that TP is finally doing a sampler album. It's been a decade since I joined TP. Thanks to Myles for letting us hear excerpts from these different vendors - the real tapes and not just a digital rip. And to Greg for the TP sampler. No problem Myles. It is my absolute pleasure to help you promote this awesome project! Larry, so you are saying that there exists a Little Hatch title through The Tape Project? Ok, that I didn't know! Earlier today I discovered I deleted by mistake the video for the Clifford Brown track off the UHA/TTP tape! Arrgh! Being that today was the day I was shipping the tape(s) to the next participant I did not have time to set the main system up and/or my D-SLR camera again to shoot the video capture. However, I do have the recording of the track so I will try to put something together somehow. It has just ocurred to me to take photos of the reel and the tape case before shipping the tape off. Ha! We'll see how this turns out! Anyway, the main thing I wanted to communicate was that this tape, as well as the Opus 3 Sampler, left me today and it's on its way to the next participant. Thanks once again Myles for putting this fabulous project together and for including me on it. I will post the video as soon as I've produced it. Last edited by vinylrules; 09-08-2018, 10:35 AM. Actually to clarify, The Tape Project is not selling sampler tapes. Paul was just kind enough to make me some sampler tapes, I have several Tape Project samplers and they are all great tapes. The main reason was back in the day I was the only guy showing tape decks at the high end audio shows, so Paul would come by the room with a surprise sampler for me to play. We would listen to the latest tunes from the latest Tape Project series, sometimes we would listen to music that wasn't even released yet, it was loads of fun. I still take the tapes to shows, in fact that shows the durability of tape! These tapes have been shipped all over the USA and Europe in the worst heat and freezing cold for many, many years, countless trips and they still sound great! Thanks, Greg for clarifying. We tapeaholics all owe a big debt of gratitude to TP and the vision of Dan, Paul and Romo for getting the 15ips 2 track tape industry going. Hey Oz, yep I remember talking at RMAF, Taj Madiwale is a great guy! Taj bought one of my very first UHA decks to be sold, long time ago, it was a black deck. He sat on it all that time till last year when he had it upgraded to the latest Ultima4 - OPS - DC unit. He emails all the time about tapes and listening parties he throws down in Florida. Will see you at RMAF 2018, this time will be with MBL in room 1130. Of course will be doing the after hours listening sessions till security tells us to turn off the music and stop bothering the normal people. Yesterday I pulled the trigger on a 3' x 8' booth space in the main lobby floor (Spot 4) by the main entrance to The Marketplace. I'll be there promoting my audio shop, but mostly my new new exclusive distribution partnership with Zavalinka Records audiophile label, and of course always promoting my Facebook group Phonogram and our Phonogram Traveling Tape Project. I don't know what to expect but I presume I will have plenty of time to hang after hours so you will see me for sure! MBL room #1130. Got it. Ok folks here you go. Enjoy!